"I don't always make pancakes, but when I do, I prefer kefir chocolate chip pancakes. I love traditional pancakes, but kefir gives these an extra dimension of fullness. When making these pancakes, I also highly recommend experimenting with various flavored kefirs, such as strawberry or pomegranate. I don't think of pancakes as healthy in general, but this recipe calls for only 2 teaspoons of sugar. If you include chocolate chips, you don't even need to use maple syrup. Enjoy some orange juice or a coffee with these." Mix flour, sugar, baking powder, baking soda, and salt together in a large bowl. Add kefir and eggs; stir until batter is moist but still lumpy. Fold in chocolate chips. Heat a lightly oiled griddle over medium-high heat. Drop batter by large spoonfuls onto the griddle and cook until bubbles form and the edges are dry, 3 to 4 minutes. Flip and cook until golden on the other side, 2 to 3 minutes. Repeat with remaining batter. Heart-shaped buttermilk pancakes sandwiched with chocolate for special mornings. Very good, just the right sweetness. Cook up perfect. A favorite. I think buttermilk produces a better pancake... these were sour. Chocolate chips probably cover up the sourness, but I left them out in the interest of health. I skipped the chocolate chips but made this otherwise exactly according to the recipe. My picky toddler inhaled three for breakfast. This is going into the regular rotation! 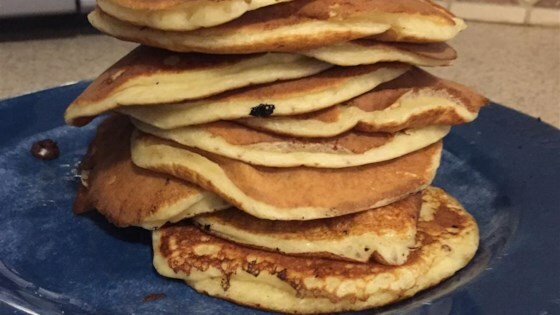 These are absolutely delicious and are the only pancakes we now make at home! They are fluffy but have a nice chewiness to them. We add frozen blueberries into the batter. I also added vanilla, and substituted kefir for 2 cups plain Greek yogurt and 1.5 cups water. Even without the chocolate chips they were great. These came out great. Made exactly as directed plus added 1/2 tsp vanilla. Used honey kefir.